Once everything is in the right position and you are sitting in your lotus, you then need to relax the whole body. When we do so we will find our breathing become stronger and a little bit quicker and this is because you want to settle down. Settling down means letting our Qi sink down to the Lower Dantian下丹田. To relax we begin by gradually relaxing from the top of the head, then the face, head and shoulders. We then relax the chest and the stomach, and finally come to the Lower Dantian, which is below the navel. You will find that your arms are sensitive and the Qi flows down them to your palms. The palms are usually together, facing upwards with the thumbs touching together. Again the left palm should be over the right palm for gentlemen, and the right palm should be over the left for ladies. 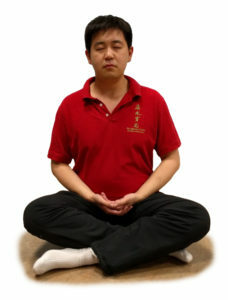 Both hands should rest in front of the Dantian so that the edge of the palms are touching the lower abdomen and the back of the palms rest on the thighs. 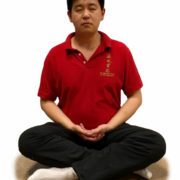 Also there many kinds of hand gestures for meditation but that is common one we usually use.